With Aquaman making his big screen debut in next year’s Batman V Superman: Dawn Of Justice, DC is looking for the right story angle to make the character resonate with comics readers. 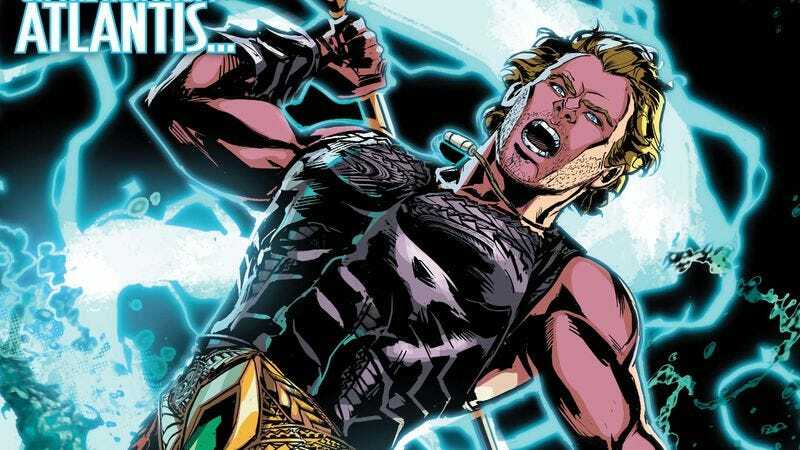 For the post-Convergence revamp of Aquaman, a new creative team gives the King of Atlantis a new status quo, making him a fugitive from the underwater city he used to rule. Cullen Bunn has become a go-to writer for Marvel and DC in recent years, largely because of his skill for character-driven superhero stories that incorporate elements of other genres. This preview of next week’s Aquaman #41 includes splashes of horror and fantasy, and the narration immediately establishes Arthur’s mental state as he tries to be a hero despite having to deal with huge changes in his personal life. Artist Trevor McCarthy and colorist Guy Major did exceptional work together on the otherwise forgettable Klarion, and this preview shows why they are a great fit for Aquaman. McCarthy’s bold page design and smooth action storytelling give the book a distinct appearance without sacrificing clarity, and Major’s colors adjust to the tonal shifts of the script to create atmospheres of calm, fear, and excitement. Aquaman’s costume update gives the hero a look that can be easily translated for live action, and the stubble and longer hair draw the character into Jason Momoa visual territory. The blonde hair is still an issue, but maybe fugitive Arthur will dye his hair black so he can avoid attention.